If my playing partners were asked to describe my game, the words “good ball striker” probably wouldn’t be the first thing they came up with. More likely, you would hear something like “he’s pretty good from behind trees” or “his water game is pretty good”. I’m not saying that I never hit the ball well, but I could definitely work on getting better contact on a regular basis. Thanks to improvements in club technology, I have been spared some frustration, but all the forgiveness in the world doesn’t replace a well-struck golf ball. The folks over at Izzo Golf have concocted a tool that is supposed to help golfers like me hit the ball better and with more consistency. It’s called the Sweet Spot Training Iron and I had the task of seeing what it had to offer. Hmmm. Well, it is definitely different looking. As one of THP’s forum members quipped, “It looks like half of the club is missing.” Actually, that description is spot on. 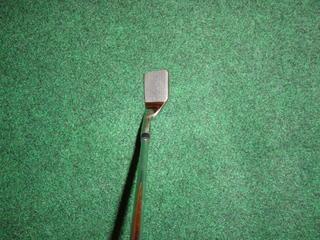 The Sweet Spot is a wedge-lofted club that consists of only the “grooved” portion of a regular club. The face is much smaller than any other club I’ve ever put my hands on. As for the weight, it feels like a normal club in the hands and the sole is virtually identical to a sand wedge, aside from the missing portion that is. The grip is actually pretty good; especially considering it’s on a training aid. My testing commenced with a chipping and (short) pitching session in my basement, which is a partially finished area of the house. Luckily, it was finished in the mid 1960’s and my girlfriend doesn’t seem to mind if a few golf balls puncture the wood paneling. Even so, I try to use hard foam practice balls for anything more than a chip shot. Chipping with the Sweet Spot seemed to be pretty easy and I didn’t have much trouble hitting the ball clean the majority of the time. I found that the ball reacted just the same way it would when hit with a normal wedge. Pitch shots took a little more concentration. Thankfully, I was smart enough to use the foam balls for them because my first one was off the toe, or what would be the toe, and it veered sharply to the right and into the wall. I found out quickly that as my swing got longer, my ability to consistently hit the club face decreased. Now, it doesn’t take a genius to figure out that might be the case, but it was blatantly obvious after a few swings with the Sweet Spot. I also tested the Sweet Spot at the driving range to see how it worked for longer pitch shots and full swings. A somewhat humorous, but important thing I want to note is that the Sweet Spot’s instructions stated I should head to the right side of the driving range. This made perfect sense to me after seeing what happened to my beloved wood paneled walls. Also, Izzo suggests that you start out by taking practice chips and pitches before moving up to full swings. This is good advice, as it took me a while to get used to the smaller head. First of all, I want to say that it is definitely possible to hit the ball clean with this iron. I hit plenty of well struck shots with a full swing and the ball behaved in a very similar way to my normal sand wedge. The distances I was seeing were also similar to those from a regular club. When I missed, the ball basically didn’t go anywhere except for right or left. I found that it was pretty easy to shank the ball with the Sweet Spot and it was also easy to send a screamer off of the toe to the right. I think that the absence of weight out towards the toe had some affect on my ability to close the club face, which may have contributed to these misses. There just wasn’t much room (literally) for error with the Sweet Spot. You either hit it well or you have a very poor shot. I’m kind of conflicted when it comes to my thoughts on this training aid. I almost hesitate to even call it a training aid. I would probably label it a feedback aid if such a thing existed. What I found is, more than anything, the Sweet Spot gave me unquestionable and immediate feedback as to whether or not I hit a good shot. It didn’t really train me to do anything or help me with grooving a swing that is more consistent. I tend to learn by feel, and nothing about the Sweet Spot helped me feel what kind of swing would produce clean shots. I could easily tell when I did the wrong thing, but I didn’t necessarily know what I did wrong or what I needed to do to fix it. That said, I do think it could be helpful to those people looking for a tool to give them instant feedback on the quality of their shots. Part of me thinks that a more experienced golfer could get more use out of it than I did. 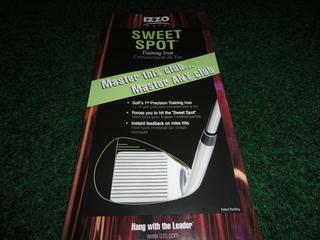 To learn a little more about the Sweet Spot Training Iron, you can visit www.izzo.com. The MSRP is $49.99, but I did spot it for less through internet retailers. Love your clear and concise review. I saw this one in the stores and was wondering about it. Thanks. I would agree the Tour Striker is probably a better option. I’ve never used the Tour Striker, but from what I know about it, it’s a bit different than this product. It’s purpose appears to be that it forces you to be in the right position to hit down on the ball, while you could still scoop the Sweet Spot and hit the ball in the air. 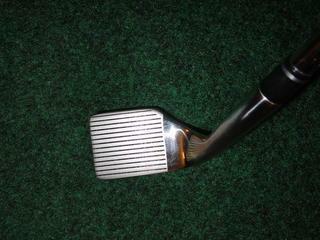 The Sweet Spot is designed to be punishing on misses high or out on the toe of the club. Like I said, I’m more of a feel learner, so I don’t know that either would work great for me without some sort of instruction to go along with them. I think they are both good products and could be useful to some folks out there, but not exactly the best for me. Good review. I might saw off one of my old wedges. Great review as always Ryan. I’ve never used this particular aid but there is another one on the market PSP (not the hand held game thing either) that I do use with regularity, Nice to see there is another option on the market now and at a better price point too! Nice review Ryan. I agree with your final thoughs; feedback aid definitely seems like a more apt description. Not too sure if this would help me or not. Great review hawk! I’ve been kicking around the idea of a training aid to help with my development. Looks like this one could be a tough one to use for my skill level. You can probably achieve the same results with a bit of tape on an old wedge. HMMMM…. Not sure if I will get one. I have this & 2 different tour strikers (5&wedge). My izzo came in this morning so I took it out for a bit. I didn’t have any issues or mis hits with this. Aim small miss small I guess. I prefer the tour striker so far. I can see this being useful though if I start toeing a lot of shots. The tour striker had a huge impact on my swing. I am not sure how helpful the izzo would have been if I had gotten it before the tour striker. But it may have been a good option.